Increasingly, it's not just what you say and how you say it but where you say it. Politicians have been working on this for some time now, staging their presentations in photo-opp settings, with members of the appropriate demographic as a backdrop. Sometimes they even print a slogan that captures their message and hang it on a banner (what I call a "PR two-by-four") for the cameras to see. And now the technique has made its way into the world of sports. 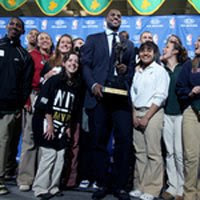 When NBA star LeBron James accepted the MVP award yesterday, he did so not in the commissioner's sitting room or even the Cavaliers offices but at Akron St. Vincent-St. Mary, the high school whence he burst onto the national scene. Certainly this was much more authentic than the aforementioned cases where public figures simply use people and places for their self-aggrandizement. A tycoon, making his pitch for 100 years of tax abatement, reclines on the bed of roses he's promising everyone if they'll let him develop his plans. A mayor, perhaps in the last city in America to open a casino, appears in front of a slot machine gushing quarters. A religious leader warns the people to mend their ways, silhouetted against flames leaping from a huge bonfire. That was a hell of a classy touch by Lebron, Inc. The young guy just keeps making all the right decisions, like giving a quick peck on the cheek to that lady in the front row, on whose lap he recently landed while chasing down a ball. You can say that again. He never misses ... How does that go about springing "fully formed from the mouth of Zeus?" Four years ago, I got the treat of having press credentials to follow him and the team around for 2-3 months, inluding the locker room and practices, to write a major magazine story on him (not a profile, really, but a story about the whole Lebron phenomenon). That was his second year in the league, and he wasn't nearly as polished as he is now, and he was a new parent as well. But I came away with one question, a mystery that still endures to this day: how the hell does a kid who was raised by a single parent, one who had to leave him to live with friends and extended family members sometimes for years at a time, grow into such a polished, class act as a young kid. It remains a mystery, but a wonderful one. To me, there's only one real answer: some degree of divine intervention. It sure seems as though he's fully aware of his gifts and is determined to use them to the fullest. Whether he stays here or not, I wish him nothing but success. I'd love to see the piece you wrote on him. I'll be sure to set it aside for you, Mike. No longer online, but come to think of it, maybe I can just scan in the hard copy and send it to you as a PDF. It was a cover story in the May '05 issue of Northern Ohio Live. I'll find it John. I actually get to the library sometimes.